Peter Haining! Everyone’s favourite horror anthologist. His output was staggering, between 1965 and his death in 2007 he produced well in excess of a hundred horror anthologies. Add to this several non-horror anthologies, dozens of non-fiction books, a handful of short stories and a couple of novels, and you’ve got quite a body of work. Originally published in 1968 (my copy is the 1974 edition from Ensign Books), this is one of Haining’s early anthologies. This is an excerpt from Crowley’s infamous Thelemic ritual known as The Mass of the Phoenix from his 1913 publication The Book of Lies. However, the first line has been altered for this volume “Devil-cake” should actually read “Incense-cake”. Whether Haining made a genuine error or whether he altered it with a view to sensationalism I don’t know, but it does set the tone nicely for the thirteen stories of sorcery, Satanism, black magic and assorted witchery which follow. This is a rather plodding, workmanlike affair concerning an inherited house and the realisation of the new owner that his ancestors were a little on the unsavoury side. This story is not actually by Lovecraft himself but by his post-mortem publisher and populariser, August Derleth. Derleth took several incomplete stories of Lovecraft’s, some of which were only fragments, and wove his own stories around them. Many believe that Derleth’s stories lack the depth, the all-encompassing despair and existential horror of Lovecraft and this certainly seems to be the case here. For a more Lovecraftian experience along similar themes, try his own The Rats in the Walls. William Buehler Seabrook, soldier, adventurer, explorer, occultist, journalist, author, self-proclaimed cannibal, ex-asylum inmate, associate of Aleister Crowley, the man who allegedly brought the zombie shambling into popular culture and, finally, suicide victim. What a guy!! This book wouldn’t be complete without this tale of witchcraft among the rural population in the mountains of the South of France. Written in first person, Seabrook has placed himself as the narrator which gives the story a conversational tone and air of believability. Who knows? Given his background, perhaps it is true. I can see Mr Seabrook getting a blogpost all of his own here at some point. It’s always a joy to see Blackwood in a contents list, he’s one of the finest writers in the genre. This is one of his series of stories which include the character John Silence, the psychic doctor. The name and tagline of John Silence may suggest a sub-Holmesian psychic detective character, a stout chap battling the forces of evil and all that, but Blackwood is a far more subtle writer than that. John Silence is merely a one dimensional background character who Blackwood uses as a cipher to resolve the supernatural stories. Described as a small man in tweeds with wonderful eyes, Silence sits somewhere between a Christ figure and a post-Freudian rationalist. Shirley Jackson writes with such a beautiful and subversive ambiguity. She may be better known for her novel The Haunting of Hill House (which was adapted for the wonderful 1963 film The Haunting) and her infamous short story The Lottery (first published in 1948 by The New Yorker, who went on to receive hundreds of letters from confused and angry readers. The story was later banned in South Africa). Here, Jackson gives us her trademark ambiguity with a disturbing little story about a mother and her two young children on a train journey. Spreading over just four pages, there is dark and chilling subtext to this story which always manages to stay just out of reach. The more you grasp at it the more it slips away. This is one of those stories that lurks in the corners of your mind for a long time and demands reread after reread. Peter Haining, now there’s a name to send folk like us shuffling off to our shelves. I’m sad to say that I don’t own a copy of this book despite the notion just recently I had it and passed up a copy on eBay! That cover is just a completely amazing, full on wraparound joy to behold. This is the kind of book, even if the contents are weak I’ll buy anyway for the cover alone which is rather sad – but true. I’ll be running a two part post on wraparound covers myself starting next week if you fancy a bit more… coincidence? Strange that Haining changed words in the quoted Liber 44 extract, maybe he just thought that Devil-cake sounded a bit more delicious to his readers. You do know I’ll have to find a copy of this now don’t you my dear Sir, you’re setting a bad example to an already incorrigible collector. To be fair though, you had me at that glorious cover and the tagline of “thirteen stories of sorcery, Satanism, black magic and assorted witchery” just served to push me over the edge. Thanks for sharing. Thankyou very much, old chap. I think we’re becoming a bad influence on each other! I’ve been scanning ebay for books after promising myself that I wouldn’t until I’d got my existing books in order (haven’t quite succumbed yet though). 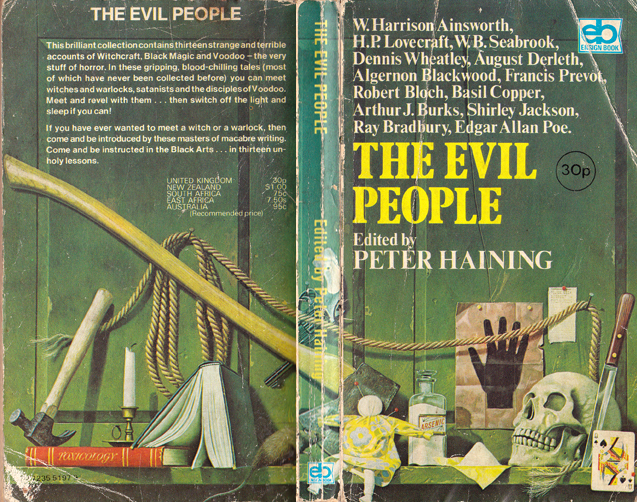 As for the wraparound covers, glorious ain’t they? I’ve got a lovely Panther Lovecraft with an Ian Miller cover somewhere. And then there are those Clark Ashton Smith’s which you posted yourself not so long ago. Nothing lifts the heart like a garish wraparound cover. Cheers and all the very best to you! I’ll try and be good if promise to do the same. Sounds interesting, I’ll go and have a look now.